Amazing Weather Details at your Fingertips. Worldwide. The Swiss Army Knife for Weather Enthusiasts! One app - many tools. In General: To display waves, this is what you do. Please use the small gears icon while showing the blue and yellow map to get the GRIB parameter screen up, tap on the layers setup and make sure that waves is turned on. Please note that in our description in the iTunes app store we state that the WW3 and FNMOC-WW3 wave data (direction, height, period) provided by the NOAA currently does cover OCEANS only. For other areas see below. Please select wave model WAM85 (Cyprus Oceanography Center) from the forecast models (see video below). This model displays waves in the Mediterranean, with a high resolution of 0.05 degrees . It is available on a 0.05 grid (lat/lon) displaying a forecast every hour up to 4 days. The model is calculated three times a day (13UTC, 17UTC and 21 UTC). 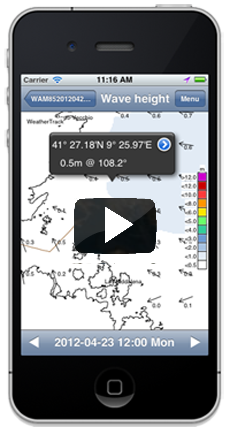 Available data layers include significant wave height, directios, period and swell height and direction. For Baltic Sea, Mediterranean Sea, Black Sea, NE Atlantic Ocean around Europe. Please select wave model FNMOC-Med. GRIB layers are significant waves, wind sea, swell, height, direction and period. Please note that you have the option to request waves for these models although these models does not calculate waves. By default WeatherTrack includes NOAA WW3. To change this, use the GRIB parameters (gears icon) while the blue and yellow area selection map is shown. Choose the model of interest (GFS, COAMPS or NAVGEM). Tap the layers icon to make sure that wave layers are requested. A new field appears, the wave model to merge in. You can choose WAM85, FNMOC-MED, FNMOC-CENTAM or FNMOC-WW3 Waves instead of NOAA WW3 to be displayed in the primary weather model. Waves for the Mediterranean Sea (Download and Animation). 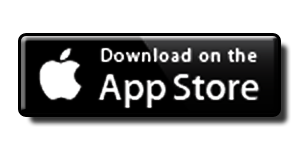 A superb app with great flexibility and reliable. Very detailed worth the money. It is easy to use, powerful features and great graphics makes it my first choice for marine weather. You won't be disappointed. Everything you could ever want in one place. Easy to download weather maps. Scrap all your other weather Apps and get this one, brilliant. A wonderful application. Being professional airline pilot, I find it very helpful and accurate. What an excellent App, I use this professionally to cross check weather patterns at work... it is very comprehensive and accurate.... well done developers...!! As a nautical officer I am using this program all the time ..very Handy and very usefull wheater forecasting program. The most complete product I have found so fare. wonderful piece of software! Very useful app, easy to use, nice support quick to react: a real must. The "en route" add on makes it even better. I use this app as a professional mariner on a tugboat. Its verry handy special on small vessels. Best weather app of them all worth every penny and more.